From stunning coastal cottages in County Galway to big farmhouses in County Mayo and guest houses in County Leitrim, our range of holiday homes in Western Ireland are ideal for big families and groups of 10+. Our large Irish holiday cottages provide the ideal base for groups to enjoy outdoor pursuits in the rugged landscapes on West Ireland; explore County Sligo, Mayo, Roscommon, Leitrim and Galway; and enjoy days out at the many visitor attractions scattered across the region . When you think of Irish holiday cottages, you might imagine coastal cottages in Galway, activity centres in County Leitrim or self-catering accommodation in rural County Mayo. Whatever your dream holiday home, as a specialist group holiday company we work hard to find you the very best big group holiday homes in Ireland. It's tough deciding where to go in Western Ireland, with such a fabulous choice of attractions and a wide choice of group accommodation. 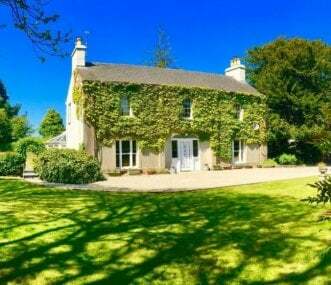 Rent a holiday house in County Sligo, the childhood home of poet and Nobel laureate William Butler Yeats, witness the landscapes that inspired much of his poetry, and visit his grave "Under Ben Bulben", in Drumcliffe. With a long history of traditional music, you can enjoy festivals and live pub music; visit quaint villages such as Enniscrone; and visitor attractions such as the landmark mountain of Knocknarea; Carrowkeel burial site; Glencar Lake; the Voya Seaweed Baths; Coney Island; the Aughris Cliff Walk; and Rosses Point. 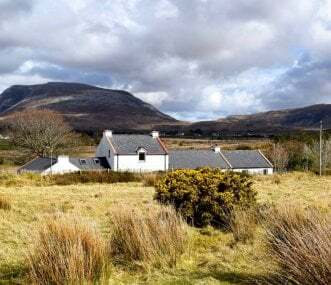 Stay at a holiday house in County Mayo and take in the region's stunning scenery, including Ireland's highest cliffs, said to be the second tallest in Europe, at Croaghaun on Achill island. Explore the lively the towns of Castlebar and Ballina; visit megalithic tombs around the Cheide Fields; go walking and visit Eagle Island lighthouse, Rockfleet Castle, the Mueum of Country Life, Burrishoole Abbey, Ashford Castle, Broadhaven Bay and the Partry Mountains. If you choose group accommodation in County Roscommon, don't miss Cruachan Ai Heritage Centre; the ancient Celtic capital of Rathcroghan; Roscommon Friary and Castle; Boyle Abbey; Strokestown Park National Irish Famine Museum; Lough Key Forest Park; and the historic Castlestrange Scribed Stone. 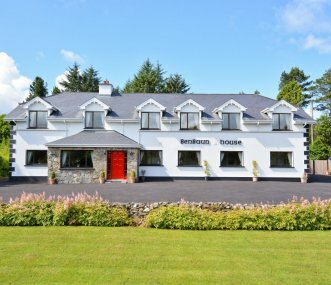 Choose a big holiday house in County Leitrim and your group can discover the lofty mountains and deep valleys of its tranquil north-west, and the amazing views around Lough Allen in the heart of the county, especially on the road from Leitrim Village to Drumkeeran. Visit Glencar Waterfall, Parke's Castle, the North Leitrim Glens, Lough Rynn House and Gardens, Costello Chapel (Europe's smallest chapel), and Sliabh an Iarainn Visitor Centre in Drumshanbo. If you stay at a large holiday cottage in County Galway you can enjoy the landscapes of the Twelve Bens mountain range; take a day trip to the Aran Islands in Galway Bay; visit the Tropical Butterfly Centre or Turoe Pet Farm; see castles such as Dunguaire and Portumna; and enjoy the natural scenery at Lough Corrib (the largest lake in the Republic of Ireland), Coole Park nature reserve, and on the region's blue flag beaches. Then there's Galway City itself, the medieval town of Athenry, and many other interesting towns and villages to explore. We try to make it easier for you to decide where to stay by providing detailed property descriptions and images for every holiday home in Western Ireland, alongside a list of activities available nearby. 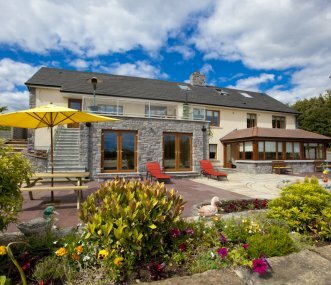 Our large group holiday cottages in Western Ireland are scattered right across the region's counties, so you can find large holiday properties in County Sligo, Mayo, Roscommon, Leitrim and Galway. By using our map functionality, whether you're planning a short weekend group break, a big reunion, or a full week's holiday, you can quickly narrow down your search to the specific part of Western Ireland that appeals to you most. Our selection of accommodation for large groups is unrivalled, so you can be confident that we have a large Irish holiday cottage to suit your needs. 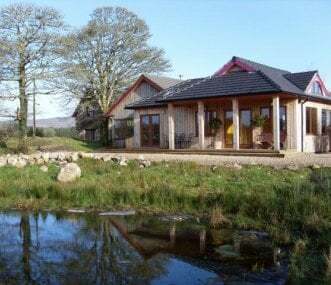 Our portfolio features large holiday cottages in Western Ireland as well as a range of other types of accommodation ranging from camping barns and hostels to luxury farmhouses, big country houses and activity centres. You can browse all of the properties in Western Ireland in our Regional Search; pick out specific holiday homes by area on our Map of Western Ireland; or use our Main Search to narrow down your results by several criteria such as location, property type and how many the holiday cottage sleeps.